1¹ AQUÁTICA Research Group in Aquatic & Environmental Toxicology, Laboratory of Aquatic Toxicology, School of Veterinary Medicine and Animal Science, Universidad Nacional de Colombia, Sede Bogotá Colombia. routine practices such as biometrics, transportation and medical procedures are a source of stress to fish. The use of anesthetics is recommended to reduce undesirable effects of stress, such as decreased feed intake and even mortality -in critical cases. the aim of this study was to determine the anesthetic efficacy of eugenol and benzocaine in juveniles of red tilapia Oreochromis sp. juveniles of red tilapia (n=30), Oreochromis sp., were distributed in groups of 10 individuals as follows; G1: eugenol (50 mg/l), G2: eugenol (100 mg/l) and G3: benzocaine (100 mg/l). The fish were individually placed in the corresponding anesthetic solution. After immersion, times to achieve the different anesthetic stages were recorded. During anesthesia, the fish were measured, weighed and blood samples were collected for glucose and plasma cortisol analysis. time to total loss of equilibrium was higher in G3 (p<0.05) compared to the other two groups. No significant differences were observed among groups regarding time to total loss of equilibrium or time to ventilation absence. Glucose levels were significantly higher in G1 (p=0.03) in comparison to G3. However, cortisol levels were higher in G3 as compared to the other groups (p<0.05). 10% mortality was observed in G1 fish. present findings indicate that 100 mg/l eugenol leads to induction of anesthesia in less than 3 minutes and recovery in less than 5 minutes, without mortality in juveniles of red tilapia. prácticas de rutina tales como biometría, transporte y procedimientos médicos representan una fuente de estrés para los peces. El uso de anestésicos está recomendado para contrarrestar los efectos nocivos del estrés, tales como disminución en el consumo de alimento y mortalidad en casos críticos. el presente trabajo buscó determinar la eficacia anestésica del eugenol y benzocaína en juveniles de tilapia roja Oreochromis sp. en este estudio fueron utilizados 30 juveniles de tilapia roja (Oreochromis sp.) distribuidos en grupos de 10 individuos como sigue; G1: eugenol (50 mg/l), G2: eugenol (100 mg/l) y G3: benzocaína (100 mg/l). Los peces fueron ubicados individualmente en la solución anestésica correspondiente. Después de la inmersión fueron medidos los tiempos para alcanzar los diferentes planos anestésicos. En el tiempo de anestesia, los peces fueron medidos, pesados y colectadas muestras de sangre para análisis de glucosa y cortisol plasmático. el tiempo de pérdida del eje de nado fue mayor en el G3 (p<0.05). No se encontraron diferencias significativas entre los grupos en el tiempo de recuperación del eje de nado y en el tiempo de ausencia de movimientos operculares. Los niveles de glucosa fueron significativamente mayores en los animales del G1 (p=0.03) respecto al G3. Sin embargo, los niveles de cortisol fueron mayores en el G3 respecto a los otros grupos (p<0.05). Se observó un porcentaje de mortalidad del 10% en los ejemplares del G1. los resultados sugieren que el eugenol a una concentración de 100 mg/l lleva a una inducción anestésica menor a 3 minutos y recuperación menor a 5 minutos sin mortalidad en juveniles de tilapia roja. os procedimentos de rotina tais como a biometria, transporte e procedimentos clínicos são uma fonte de estresse para os peixes. O uso de anestésicos está recomendado para diminuir os efeitos nocivos do estresse, como por exemplo, a diminuição no consumo de alimento e em casos críticos mortalidade. o presente trabalho buscou determinar a eficácia anestésica do eugenol e da benzocaína em juvenis de tilápia vermelha Oreochromis sp. neste estudo foram utilizados 30 juvenis de tilápia vermelha (Oreochromis sp.) distribuídos em grupos de 10 indivíduos de acordo ao anestésico utilizado; G1: eugenol (50 mg/l), G2: eugenol (100 mg/l) e G3: benzocaína (100 mg/l). Os animais foram passados pela solução anestésica correspondente, na qual se mediram tempos para atingir os diferentes estádios de anestesia. No tempo de anestesia, os peixes foram medidos, pesados e coletadas amostras do sangue para análise de glicose e cortisol plasmático. o tempo de pérrdida do eixo de nado foi maior no G3 (p<0.05). Não se encontraram diferenças significativas entre os grupos no tempo de recuperação do eixo de nado e no tempo de ausência de movimentos operculares. Os níveis de glicose foram significativamente maiores nos animais do G1 (p=0.03) respeito ao G3. No entanto, os níveis de cortisol foram maiores no G3 em relação a os outros grupos (p<0.05). Observou-se um percentual de mortalidade de 10% nos exemplares do G1. os resultados sugerem que o eugenol a 100 mg/l provoca uma indução anestésica menor a 3 minutos e uma recuperação menor a 5 minutos sem mortalidade em juvenis de tilápia vermelha. Handling of fish during sampling or clinical procedures requires the use of anesthetics (Ross and Ross, 2008). Additionally, anesthetics prevent or minimize suffering of fish in routine practices of fish farming. Activities such as biometrics, transportation, tagging, removal of gametes and egg collection are associated with acute stress for the animals. Anesthetics decrease trauma and undesirable effects linked to stress (Okamoto et al., 2009; Vidal et al., 2008). Stress can lead to high incidence of disease, decrease of both appetite and weight gain, changes in behavior, and mortality -in critical cases (Corredor and Landines, 2009; Park et al., 2009). In fish, stress triggers the hypothalamus-pituitary-inter-renal axis functions, resulting in increased blood levels of catecholamines and cortisol (Wendelaar Bonga, 1997). Additionally, alterations in levels of glucose, lactic acid and free fatty acids are expected. Both levels of cortisol and plasma glucose are acute-stress indicators in fish (Corredor and Landines, 2009; Park et al., 2009). The choice of anesthetics depends on availability, cost, ease of use, safety for the operator and the environment, rapid induction, low initial hyper-activity, adequate immobilization, effective analgesia and fast recovery, without prolonged ataxia or other undesirable effects (Ross and Ross, 2008). Several chemical anesthetics are currently utilized for these purposes, the most common being tricaine methanesulfonate (MS-222), benzocaine, quinaldine, quinaldine sulphate, 2-phe- noxyethanol, ethyl aminobenzoate, etomidate and metomidate, amongst others (Readman, 2013). In search of new anesthetics for fish, new natural products like eugenol have emerged. Eugenol is obtained from distillation of Eugenia aromatica and Eugenia caryophyllata trees (Soto, 1995). Eugenol (2-methoxy-4- (2-propenyl) phenol) is slightly soluble in water, being necessary a dilution in 95% ethanol to prepare a 100 mg/ml stock solution. However, the dilution may be irritating to skin or mucous membranes, suggesting the use of protective measures (Ross and Ross, 2008; Noga, 2010). Eugenol has several uses in addition to anesthesia: ingredient in food industry, analgesic, antibacterial, antifungal agent and local anesthetic in dentistry, the latter being approved by the Food and Drug Administration in the US (Pereira-da-Silva et al., 2009; Stoskopf, 1993). The use of commercial preparation of eugenol is legal in fish without withdrawal time in Australia, New Zealand, Korea, Chile, Costa Rica, and Honduras (Noga, 2010). On the other hand, benzocaine is poorly soluble in water, which makes it necessary to prepare a stock solution of 100 g l-1 with 95% ethanol (Ross and Ross, 2008). Benzocaine is derived from benzoic acid and is also used as a local anesthetic in mammals (Noga, 2010). In South America, benzocaine is the anesthethic most widely used in fish species such as Trachinotus marginatus, a common species in Brazil, Uruguay and Argentina (Okamoto et al., 2009). Eugenol has been investigated in species like Colossoma macropomum, Brycon cephalus, Oreochromis niloticus, among other fish species widely cultivated in countries of Central and South America (Roubach et al., 2005; Vidal et al., 2007; Vidal et al., 2008). In Colombia, eugenol is used in several fish species but reports on the characteristics of anesthesia are scarce. The aim of this study was to determine the anesthetic efficacy of eugenol and benzocaine in juveniles of red tilapia Oreochromis sp. Acclimation and experimental procedures followed guidelines by the Bioethics Committee of the School of Veterinary Medicine and Animal Science, Universidad Nacional de Colombia, Bogotá. Thirty juveniles of red tilapia (Oreochromis sp.) from La Terraza fish farm (Villavicencio, Colombia) were used. The animals weighed 56.3 g on average and measured 14.3 cm. The fish were acclimated to the conditions of the Aquatic Toxicology Laboratory, School of Veterinary Medicine and Animal Science, Universidad Nacional de Colombia (Bogotá, Colombia). The animals were housed in 40 gallon-glass aquaria equipped with a filtration system, constant aeration and temperature control (25 oC) for two weeks. During this time, water syphoning and refills of 30-50% were performed two or three times per week. The fish were fed with commercial feed (32% protein) until one day before starting the experiment. Commercially available eugenol (2-methoxy-4- (2-propenyl) phenol) and benzocaine were used. Eugenol and benzocaine stock solutions were prepared by dissolving 85% eugenol or benzocaine in 99.9% ethanol, respectively, obtaining working solutions of each anesthetic (100 mg/ml). After acclimation, fish were randomly distributed in three groups of 10 animals. Eugenol was evaluated at two concentrations: 50 mg/l (G1) and 100 mg/l (G2), whereas benzocaine was used at 100 mg/l (G3). These concentrations were chosen according to results reported by Deriggi et al. (2006) and Vidal et al. (2008). In all three groups, water pH was measured before and after dissolving the anesthetic solutions. The fish were individually placed in the corresponding anesthetic solution. After immersion, time to achieve the anesthetic stages described by Woolsey et al. (2004) were recorded. Hyper-excitability, if any, upon contact with the anesthetic solution was also registered. When fish reached stage 5 of anesthesia or when ten minutes in the anesthetic solution had elapsed, fish were removed from the tank and observed during ten minutes or until signs of recovery happened before reaching a ten-minute period. The ten-minute period was chosen given that it isusually an ideal time to accomplish various clinical procedures on fish (e.g. blood sampling, biopsies, etc.). Then, the animals were transferred to anesthetic-free aquaria (recovery tanks) allocated for each concentration of the anesthetic solutions, with constant aeration and temperature control. Once fish were transferred to the recovery tanks, times to recovery of the swimming axis (RSA) and total recovery (TR) were registered. The animals were kept under observation for 24 hours. During the anesthetic process in state 5 of anesthesia fish were weighed, measured and blood samples were collected. Blood samples were collected with heparinized syringes from the caudal vein to measure blood glucose and plasma cortisol. Blood glucose was measured immediately using a glucometer (ACCU-CHEK® - Roche, Barcelona, Spain). Subsequently, blood was centrifuged at 5,000 rpm for 10 minutes at 4 °C and plasma was transferred into cryotubes stored at -70 °C prior to cortisol analysis with a commercial ELISA kit (SPINREACT® - Bio-analytics, Madrid, Spain). Analysis was performed, depending on the normality of the variables, through ANOVA or Kruskal-Wallis tests at 5% significance. Pairwise comparisons were performed using Tukey and Kramer (Nemenyi) tests with Tukey-Dist approximation for independent samples (Pohlert, 2014). The statistical program R (version 2.15.1) was used for this purpose. The fish in G2 had higher length (p=0.005) and weight (p=0.006) compared to fish in the other two groups. All fish underwent the anesthetic phases described by Woolsey et al. (2004) (Table 1). In G1 and G3, 30% of the animals had hyperactive reaction upon contact with the anesthetic solution, characterized by frenetic swimming against the aquarium walls, whereas 50% of the fish in G2 showed the same behavior. However, these differences were not statistically significant (p>0.05). The fish anesthetized with eugenol (G1 and G2) showed behavior corresponding with a deeper anesthetic plane as compared to the benzocaine group (G3). In the immersion, benzocaine-treated fish had fin movements despite having lost the swimming axis. Time to loss of swimming axis was higher in G3 compared to the others (p<0.01). On the other hand, time for the first reaction after reaching the anesthetic plane happened later in G2 than in G3 (p=0.03). Total recovery time was also higher in G2 (p=0.04) compared to G1. No significant differences were found among groups with regard to loss of reactivity and recovery of swimming axis. Different letters within the same column indicate significant differences amongst anesthetics (p<0.05). Total loss of reactivity: time for total loss of reaction or when fish reached 10 minutes in the anesthetic solution. Initial reaction: time elapsed until the first reaction of anesthetized fish happened or 10 minutes under observation without reaction. Figure 1 Blood glucose (mg/dL) and cortisol (μg/dL) in juveniles of red tilapia Oreochromis sp. Glucose and cortisol values are shown in Figure 1. Glucose levels were significantly higher in G1 (p=0.03) compared to G3. However, cortisol levels were higher in G3 compared to the other two groups (p=0.0005). In the post-anesthetic, 24-h monitoring period, mortality was observed in G1 (10%), whereas in G2 and G3 this event was not observed. No significant differences were found for water pH values before or after dissolving the anesthetic (p>0.05). Values before and after dissolving the anesthetic were: G1 6.6 and 6.8; G2 6.9 and 7.0; and G3 6.6 and 6.9 respectively, without significant differences between groups (p>0.05). (n=10 fish/ group) (mean ± S.D.) anesthetized with eugenol 50 mg/l (G1), eugenol 100 mg/l (G2), or benzocaine 100 mg/l (G3) (n=10 fish/treatment). Different letters indicate differences between groups. The number of fish showing hyper-excitability upon contact with the anesthetic solution was not significantly different among groups. Some authors indicate this may be related to the presence of ethanol as a solvent in the anesthetic solutions (Vidal et al., 2008). However, Readman et al. (2013) reported that zebrafish are aversive to the anaesthetics commonly used in fish, regardless of the ethanol dilution. Additionally, G1 and G2 induced anesthesia faster than G3, considering the time for loss of swimming axis. Similar results were reported by Vidal and Col. (2008) in Oreochromis niloticus, with induction time of 50 seconds at 100 mg/l eugenol. The time for total loss of reactivity was signaled as the time required for the loss of all reflexes. In the eugenol groups, the fish did not stop ventilatory movements at all. Stoskopf (1993) reported higher frequency of ventilatory rate when benzocaine was used. Future studies should evaluate heart rate as an indicator of anesthetic depth. Further, the initial reaction time was significantly higher in G2 when compared to G3. 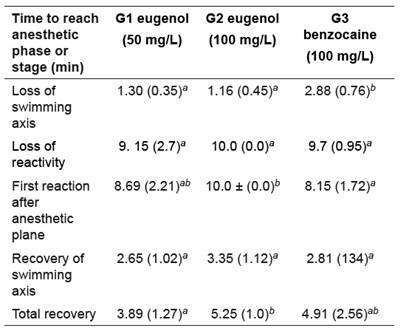 These findings suggest a lower depth of anesthesia induced by benzocaine as compared to eugenol. For G1 and G2 groups it took less time to loss the swimming axis compared with G3. However, these two groups spent more time to show initial reaction compared with G3. These results suggest that eugenol may be safer than benzocaine for clinical procedures in laboratory and fish farming. Fish in the three groups showed adequate recovery time (3.89 ± 1.27 minutes), which is within the ideal range (less than 5 minutes; Ross and Ross, 2008). Therefore, eugenol induced deep anesthesia with adequate recovery time and no medullary collapse. Similar results were reported by Vidal et al. (2008) with eugenol at 75 mg/l in Nile tilapia, obtaining a recovery time of 2.38 minutes. 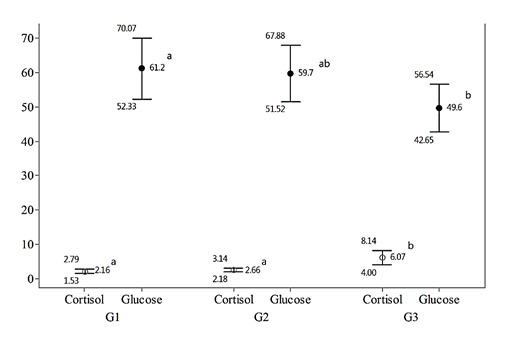 Glucose values were significantly higher in G1 compared to G3. This indicates that eugenol 50 mg/l was not effective enough in inhibiting stress. These findings are similar to those reported in other species such as rainbow trout which showed higher plasma glucose in comparison to those treated with tricaine methanesulfonate MS-222 (Wagner et al., 2003). On the other hand, Roubach et al. (2005) reported no significant differences in plasma glucose concentrations when eugenol and benzocaine in Colossoma macropomum were compared. In another report, no significant differences were observed in glucose levels between eugenol, MS-222 and 2-phenoxyethanol in perch (Velíšek et al., 2009). Iversen et al. (2003) found no significant differences in plasma glucose levels in salmon using eugenol, isoeugenol and benzocaine. Similar studies in Nile tilapia reported no differences when comparing plasma glucose levels in fish anesthetized with eugenol, benzocaine and sodium chloride (Oliveira et al., 2009). Cortisol was significantly higher in benzocaine-anesthetized fish when compared with both eugenol groups. Similar findings in Brycon cephalus were reported for animals during transportation with and without eugenol. Animals transported with eugenol had significantly lower plasma cortisol levels (Inoue et al., 2005). During transportation of salmon, higher values of plasma cortisol were observed in the control group compared to eugenol (Iversen et al., 2009). In the same study, higher plasma cortisol concentrations were found in benzocaine-exposed fish as compared to those exposed to eugenol (Iversen et al., 2003). In contrast to the present results, Palic et al. (2006) reported no significant differences in plasma cortisol concentrations of fish anesthetized with MS-222, metomidate and eugenol (Palić et al.,2006). In rainbow trout, no differences were observed in plasma cortisol levels between MS-222, eugenol, and CO2 (Pirhonen et al., 2003). Cortisol concentrations in G1 and G2 suggest that eugenol was more effective in reducing stress (Inoue et al., 2005; Iversen et al., 2003). All fish recovered and no mortality was reported. However, one fish in eugenol (50 mg/l) was found dead during the 24h recovery period. In this case, it was not possible to identify the cause of death and no reliable necropsy findings, due to autolytic changes, allowed conclusive evidence. Nevertheless, it was observed that the specimen was affected by other fish nipping in the recovery tank. Nipping is characterized by a swimming pattern towards the tank-mates followed by biting of head, caudal fin, median-lateral area of the body, and the ventral area (Giaquinto and Volpato, 1997). According to present results, 100 mg/l eugenol is safe for juveniles of red tilapia, without causing mortality. This study has practical and innovative applications in Colombia regarding the anesthetic management of finfish species. In conclusion eugenol 100 mg/l leads to induction of anesthesia in juveniles of red tilapia in less than 3 minutes and recovery in less than 5 minutes, without causing mortality. This study was funded by Aquatic and Envinronmental Toxicology Research Group (AQUÁTICA), Universidad Nacional de Colombia.